Engineer is a very light sleeper - always has been. The fact that I may or may not snore doesn't help matters. He uses earplugs every night and like everything else, they need to be washed. Here is my highly scientific and complicated way of cleaning earplugs. Put the dirty earplugs in a sock. Tie the open end of the sock so that they don't fall out in the wash.
Wash the socks in their normal laundry load. Unknot the sock and let the earplugs air dry. Now you have clean earplugs. 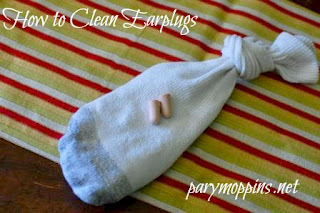 Clean earplugs Work for Me! This is sheer genius, Ms Pary Moppins! My husband uses ear plugs, so this will come in very handy. Now I'm trying to think of other small items I could knot up into a sock and wash, lol! Thank you for coming by over at Texas Women Bloggers, by the way- I appreciated it! Thanks! I wash hair elastics this way too. :) Thanks for stopping by! This is genius! I really need to get a good pair of earplugs as I'm a very light sleeper and my husband is a snorer. I honestly didn't know you could clean them-are these the disposable ones? Thanks. I would assume they are considered disposable since they come in a pack of 50. :) I only wash the same pair a couple of times before throwing them out. If your plugs look like they are starting to be a little worse for wear, then throw them out. Thanks for stopping by!